brought forth a needed solution for educational communities. The Social Sentinel® platform offers the only comprehensive safety platform in the marketplace powered by proven machine learning and artificial intelligence logic. We study and understand the language of harm and violence. We deploy advanced technology and work with subject matter experts to constantly evolve Social Sentinel’s proprietary machine learning methodologies. We built technology that searches worldwide to make local connections beyond a geo-fence. Machine learning (AI) algorithms classify data into alerts for immediate attention and insights for a broader context, leading to greater understanding. We create context by highlighting discussions and trends relevant to your communities right now. With a single login you can easily stay on top of the activity and insights Social Sentinel delivers. Our desktop application gives you access to details about the combined performance of your subscribed products, and the ability to dive deeply into their individual discoveries. See the whole story anytime. Shared in context—as alerts, insights, discussions, or trending topics—Social Sentinel aggregates meaning and reduces the burden of analysis, delivering only the must-knows. Get insights on the go. Weekly and monthly performance summaries easily let you share your account’s activity with stakeholders and quickly notice trends over time. Individual dashboards for our social media scanning, integration with Gmail, and shareIt products help increase awareness of what’s happening outside the walls as well as inside them. Learn more about our school safety products below. Help keep your students safer by respectfully accessing the digital conversations happening publicly on social media. We help you weed out the noise and connect with the posts that matter most to your schools’ well-being. Starting with Gmail, expand your awareness of the safety and wellness conversations happening on your G Suite for Education platform, and do it respectfully. Speaking up to share something can be overwhelming, regardless of whether it's good or bad news. Give students, faculty, and staff a safe and simple way to share important information anonymously. Stay on top of the activity and findings delivered by our products through a single, comprehensive view. 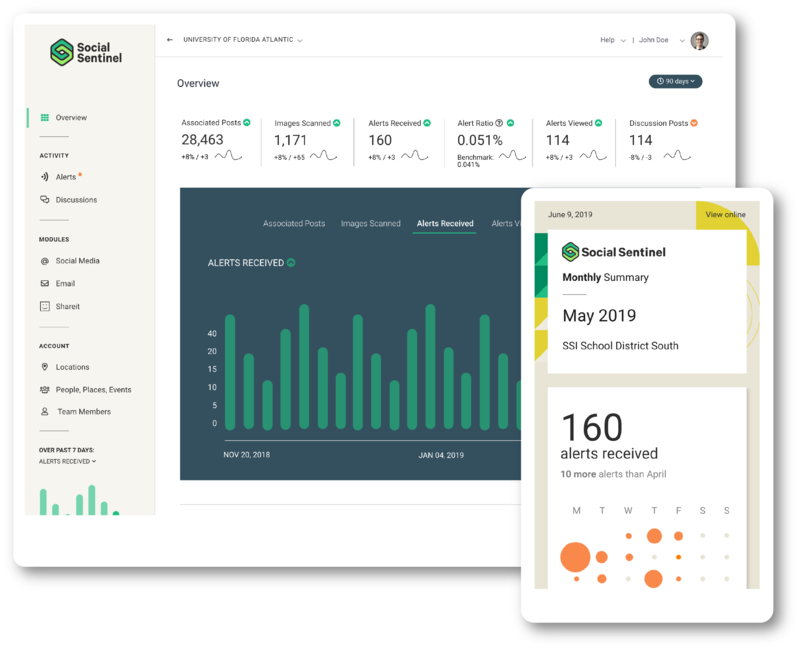 Social Sentinel provides insights into your schools’ safety, security, and well-being. See Social Sentinel in Action. Let our team show you how safer schools start with Social Sentinel.